Housed in a heritage shop-house within walking distance of Maxwell Road Hawker Centre and Amoy Street Food Centre, Box Capsule Hostel offers affordable accommodation with free WiFi and a daily breakfast. The hostel is centrally located in the heart of the city. Raffles Place is 950 m away while the iconic Marina Bay Sands is 2 km away. You can also check out the vibrant streets of Chinatown, just 500 m away. Sentosa Island is 4 km away while Changi International Airport is 17 km from the hostel. Dormitory rooms are cooled with air conditioning. They feature contemporary décor and come with individual personal lockers and curtains for privacy. Guests have access to the shared bathroom facilities and can choose between soft or hard pillows. Attraction tickets are available at a discount at the hostel, which features friendly staff. Guests can relax on a full body massage chair or use a neck massager and foot massager. Free usage of the computers is available at the lobby. 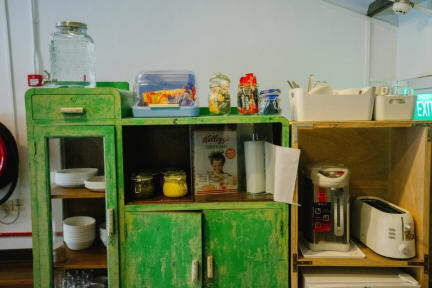 Breakfast includes a free flow of coffee, tea, milk and juice, Box Capsule Hostel does not house a restaurant however guests can sample various cafes, restaurants and bars nearby. Chinatown is a great choice for travellers interested in convenient public transport, city trips and culturally diverse food.